Photo: Robert L. Wilson House, ca. 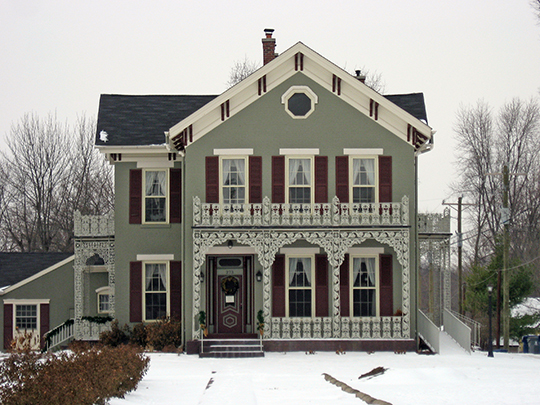 1868, 273 South 8th Street, Noblesville, IN. Listed on the National Register of Historic Places in 2008. Photographed by User:Nyttend (own work), 2011, via Wikimedia Commons, accessed October, 2013. The Hamilton County Courthouse is located at 1 Hamilton Square, Noblesville, IN 46060; phone: 317-776-9629. The lands within the bounds of Hamilton County, Indiana, together with other lands, were purchased by the Government from the Indians in 1818. At that time there was but one white man permanently located within the present bounds of Hamilton County. This man was William Conner. He was at that time living in a double log cabin with his Indian wife. This cabin was situated four miles south of the present site of Noblesville, on the east bank of the White River. His place was called a trading post. In one room of his cabin he kept beads, lead, flints, steel knives, hatchets and such other goods and trinkets as were usually necessary in such a place. The first school taught in Hamilton County to white children was taught by Sarah Finch in a small cabin, built for that purpose; here was also organized the first Sunday School. In the early spring of 1821 a man by the name of Foster built a mill called a corn cracker, on the north bank of Stony Creek, a few rods below what is known as the Dill Mill Dam; he built a cabin on the hill on the south side of the creek. This was the first water mill built in Hamilton County, and although a small affair, was patronized in 1821 by the people of Indianapolis, as well as the settlers of Hamilton County. When a sufficient number of settlers had settled and located within the present bounds of Hamilton County to entitle them to become a separate organization under the law, they made application through the proper channel, the Legislature, for a charter authorizing them to become a separate and independent jurisdiction. This step was taken in the summer and fall of 1882. The application was presented to the Legislature of 1822-1823, and on January 8, 1823, pursuant to the petition, an act was passed.